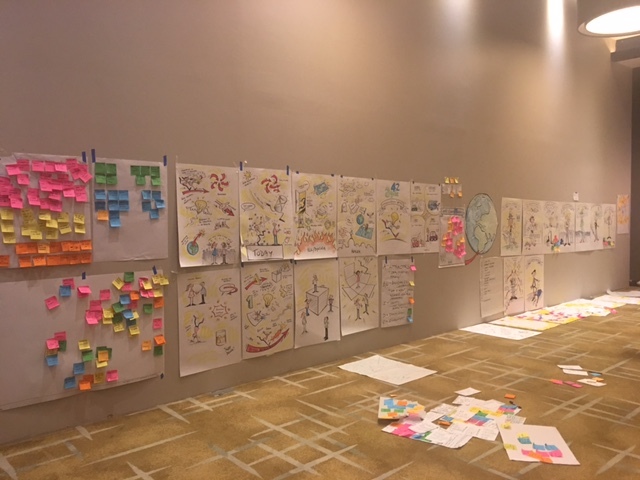 Last week I had the opportunity to facilitate a week-long “innovation sprint” for Agile 42, an international agile coaching company. After recovering from my time spent facilitating 39 other facilitators (on my own!) I finally had time to reflect on my experiences and learnings from the week. One of these is the importance of framing. The framing of an event (i.e. what we call it) creates a container within which the process ro work unfolds. It therefore constrains the process in ways that are either enabling or disabling. Framing this event as an “innovation sprint” created expectations and dynamics in the group that could paradoxically end up stifling innovation instead of enabling it. As this is a group of agile coaches, it made sense to use Agile terminology like “sprint”, however the term immediately evokes patterns from implementing Scrum (a specific Agile methodology) and tends to create expectations of a linear, iterative, time-boxed process accompanied by regular feedback and planning ceremonies. This brings the very real danger of premature convergence, and a focus on iterative problem solving. The pattern of iteration and regular feedback cadences also brings an expectation for regular check-ins to determine if “we are heading in the right direction”, which in this context is not a relevant question there is no “right direction”, especially in early stages of the process where diversity, enquiry and wide exploration are required. The group highlighted two patterns that emerged here: one of pressure (innovate or die) and another of prejudice (only some people can innovate). Innovation was seen as “hard”, about that “ONE big idea” that had to be lucrative. It is risky – expensive if you fail. Innovation is fast and quick; it’s an imperative “innovate or die”. On the other hand it’s also a “buzz word”. When asked to name this innovation narrative names like “we’re all confused” emerged. The group agreed that the impact of this on them as they’re about to embark on this week-long process was a paradoxical feeling of pressure to come up with a brand new idea, while at the same time not believing it was actually possible. Simply externalising these meanings and acknowledging them created a much more open container for work the group needed to do in the workshop. Upon reflection later on in the week, many participants referred back to this process as a key break-through moment. 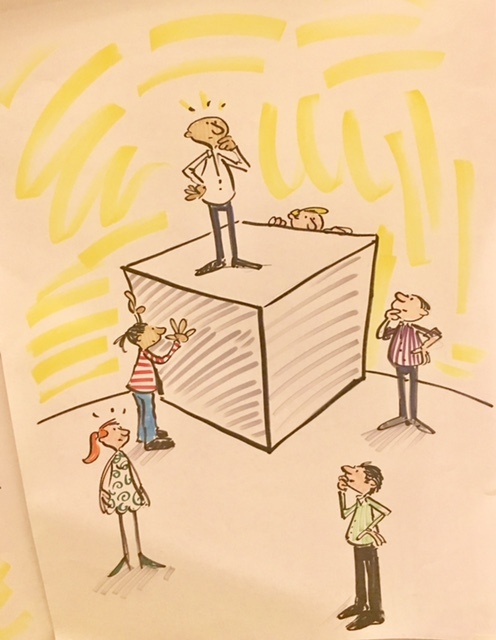 We also challenged the cliché of innovation requiring us to “thinking outside the box” … how can we think outside of a box when we often don’t even know what that box is (and if it even exists). 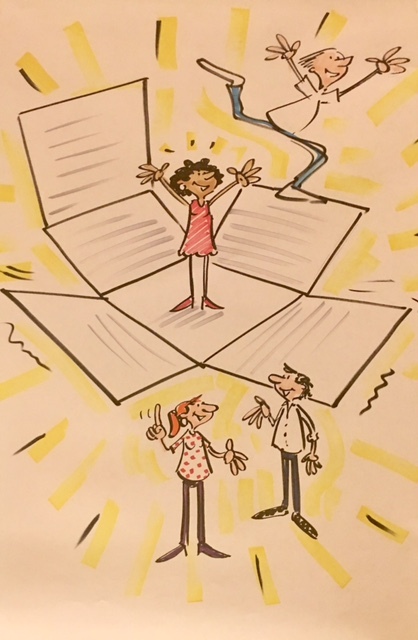 We chose to reframe our process as “unfolding the box”, this served to shift the perspective of the group to one of curiosity and enquiry, again taking the pressure off. Future backwards to understand the current reality (today), future dreams (patterns in heaven) and fears (patterns in hell) of the group as well as gain insight into the shared corporate memory (patterns in the timeline). Here the group discovered that even though they are distributed across many different countries and continents, there were golden threads that tied them together. Cynefin contextualisation to surface sense-making patterns and biases. Archetype extraction – prior to the workshop, we collected stories about current agile practices (best and worst) using Sensemaker. We used these to extract emergent archetypes, visualised by a cartoonist in the workshop. We used appreciative interviews to surface and share success stories about client engagements as well as sales and marketing experiences. We then asked the ASHEN (Artifacts, Skills, Heuristics, Experience and Natural Talent) perspective questions and to surface key knowledge objects that exist in Agile42. We applied ABIDE (Attractor, Boundaries, Identity, Diversity & Environment) as perspective lenses to understand the market and “influencable” patterns. All of these methods served to make patterns visible and keep the group from falling into old patterns of identifying problems and then trying to find solutions. One realisation that came from the group once the various perspectives were externalised was around innovation being much like a chef that combines existing ingredients into brand new recipes. Chefs don’t create new ingredients, they combine what is already there in unique ways. The challenge for this group was to see themselves (e.g. skills & offerings) and their markets (attractors, boundaries etc) from multiple perspectives to potentially recombine existing capability to new market opportunities. This was not an easy of comfortable process for the group. Many of the activities seemed disparate, each providing a different perspective or unfolding a different aspect of the box. There was no defined outcome, and no linear process where each activity built on another. Being complex methods, they were largely emergent and involved ambiguous instructions. Golden threads only became apparent on day 3, and some activities were “left hanging” and never really resolved. The majority of the people in the room were coaches, and as such are used to being the experts and the “ones who know”. 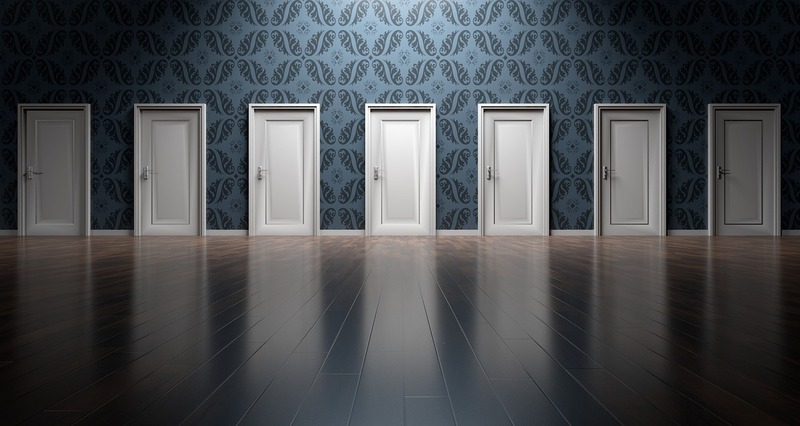 The inherent uncertainty and ambiguity that such a divergent process brings challenged this identity and brought greater empathy for how their clients feel when they experience similar processes. When we did finally converge on day 4, the majority of the group felt that the discomfort was worth the end result. Many felt that the value was as much as the experience of the uncertainty of the process, and the associated learnings than the eventual outcome (a portfolio of experiments and ideas that will be actioned in the next few months). One anecdote from a participant really struck me. Such is the nature of innovation … most often it happens by accident. It’s about serendipitous encounters and connections – we can create conditions where there is an increased likelihood for it, but in the end we can’t mandate, manage or create innovation. I empathise with the expectations problem from how you frame an event — if it’s something they are familiar with (e.g. a sprint) you’re dealing with past patterns of experiences, which can work like a silent saboteur. If, however, you use terminology no-one has heard of you risk not having a room to talk to in the first place (i.e. what’s this ‘dispositional amplification in Cynefin’ all about? sounds like mumbo jumbo – let’s not bother!). Might be where a really well-thought through metaphor can come to the rescue – ‘Crossing the river by feeling the stones’ or ‘learning how to survive in the wild when you’ve only been trained in the zoo (!) – can help generate buzz but keep things open and therefore fluid? Innovation is one of those words the writer Milan Kundera would have probably added to his ‘Dictionary of widely misunderstood words’ by which we fool ourselves that we’ve understood each other. The course on (Complexity – Sense-making and) Innovation I teach at a university here starts with having the class define innovation from listening to 15 ‘experts’ define it widely differently – coming to their own constructed version of it. 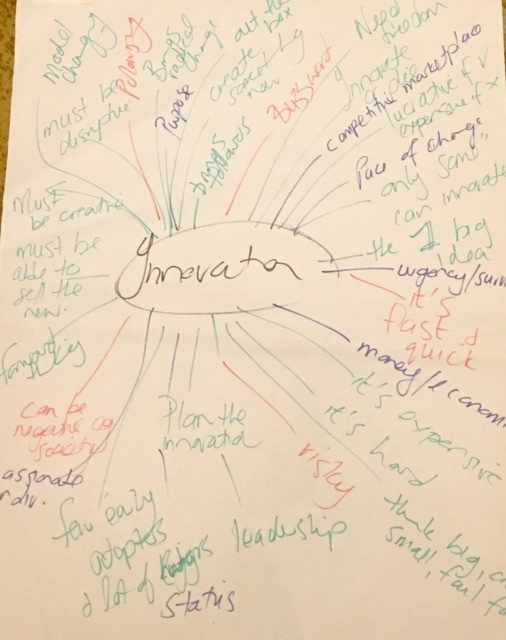 I then try to de-construct that as we go by introducing ‘sustaining’ innovation (important ‘tweaks’) versus ‘disruptive’ (sudden paradigm shifts) as well as innovation as seen by you (this is new to us) vs as seen by others (as seen by the market). This frees people up to use the word with some thought and without misattribution and to let them use innovation as a tool (improving something so a customer values it) rather than as a pressure to conform (‘coming up with ONE big idea’). You seemed to have hit on that with the insight that chefs don’t procure the ingredients but just make them work, which is a rather nice metaphor in itself. 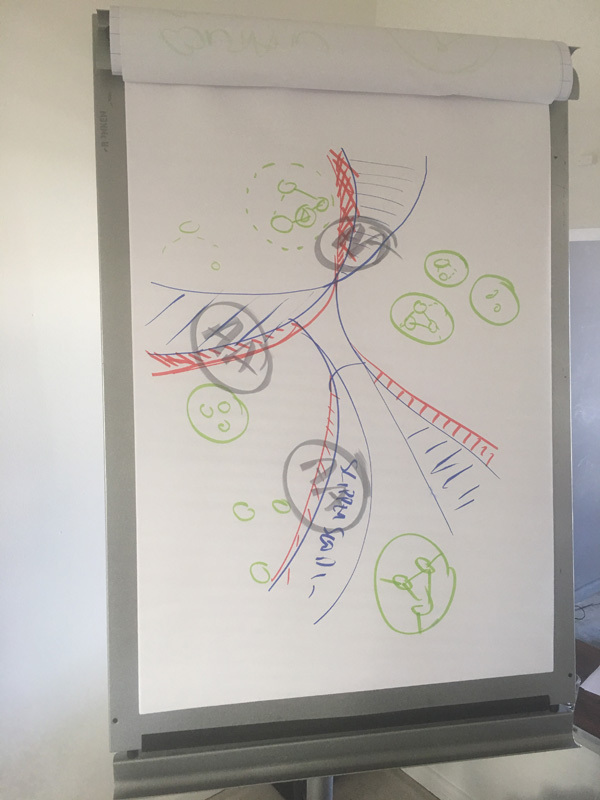 The big insight though is in how they come through the uncertainty – the complex or tangled domain in Cynefin – as it’s there that the new value is: there is always more to learn then we can currently know, which is why the opportunities are there. That we often feel discomfort when we’re out of our comfort zone is pretty important I feel – because we’re not going to innovate unless we can embrace this. I agree with you re the metaphors (and thanx for referencing my zoo vs jungle one … it seems to resonate pretty widely!) – another is the contrast between a symphony orchestra that performs and interprets a known piece of music vs a jazz or blues band that co-creates emergent music within enabling constraints.